You can now access powerful editing features via the cloud from almost any portable digital device. The options for sophisticated post production editing are becoming ever more varied. Now, you can even carry them with you in your pocket. One of the most interesting trends I’ve been following in post production over the past year is the rise of truly mobile editing systems. 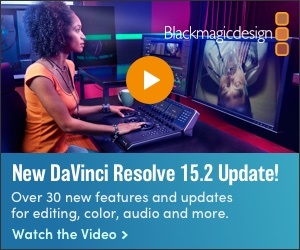 I don’t just mean laptops running NLE software, but small portable devices such as tablets and even cell phones that provide access to the kind of editing power once relegated to permanent edit bay installations. I remember with great fondness the thousands of hours I’ve spent sitting next to producers in various edit bays, surrounded by computers, monitors and cabling. My only gripe was the atmosphere was as gloomy as Dracula’s cave and chilled not for the comfort of the inhabitants but for the preservation of the equipment. Oh how I longed to take the super-charged creativity of an edit session out of the dungeon and into the free light of day. I’ve reported on several mobile editing options in past stories, and at the IBC2018 convention in Amsterdam I ran into a number more that were, frankly astonishing. In this two-part look at the trends in mobile post in the field we are going to use cell phone editing as the ultimate example, with Apple’s iOS or Google’s Android carrying market dominance, although anything available to a cell phone is probably also to be found on their larger sibling’s tablets. First a bit of a recap. Once post production systems got beamed up to the cloud and could be accessed via a browser, tapping into them on a cell phone became the logical next step. 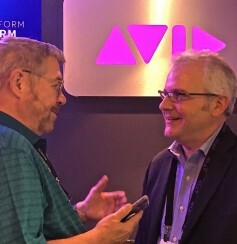 As I discussed with Avid’s president Jeff Rosica, during their IBC press conference in a story posted here on 9/14/2018, you can access Avid editing from anywhere with Internet connection. 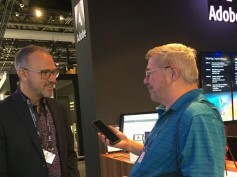 Then, during my Avid booth visit with Ray Thompson, Avid’s director of market solutions, broadcast and media,in Hall 7 of the RAI convention center, I asked him whether, given the capabilities of MediaCentral Cloud UX, there would ever be a need for a standalone cell phone app for Media Composer. Before IBC even opened its doors, Adobe tantalized us with a preview of what it is temporarily calling “Project Rush”, revealing an early glimpse at VidCon, June 20-23 in Anaheim, CA. Then, thanks to Adobe’s Creative Cloud technology, the line between desktop and mobile systems becomes blurred, meaning you will be able to access them all on Android or iOS mobile devices. A key concept behind Project rush is that once you start a project out in the field, it is immediately synced through the Adobe Creative Cloud so you can pick it up where you left off on your desktop system back home. Naturally, when I visited the Adobe booth at IBC, Project Rush was one of the first items I wanted to ask about. And when will it be ready to be delivered? Not wanting to venture a firm release date, Roberts assured me Project Rush should be out by the end of the year. When I got to the Grass Valley exhibit, I asked Grass Valley’s Atsushi (Alex) Kataoka, director of product management, editing systems whether now that the new Edius version 9.3 can run in the Amazon AWS cloud we are going to see a dedicated cell phone app for it. He told me that is not yet under development, but reminded me that their newsroom editing workflow now called SAM Vibe includes the SAM Go! browser-based editor which can indeed run on portable devices. In addition, with the help of Python scripts, its stories can be fed to the high-end SAM Rio finishing system, thereby providing a cell phone-to-craft editor connection over the Internet. That story is slated to be posted on 10/10/2018. Arvato Systems, part of the Bertelsmann-owned Arvato network, also had a browser-based edit system on display called MediaEditor. While not offering as fully functional editing capability as some of the other offerings, Arvato’s strategic product manager, Ben Davenport, clarified for me that it can be called upon for simple edits, and laying in Voice Overs and graphics. 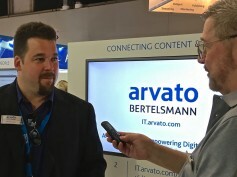 Arvato’s strategic product mgr., Ben Davenport. All of these mobile applications give you access to the main edit system in your primary facility. But what I am finding most exciting in mobile editing are the new software offerings designed not to call home over the Internet, but to actually run on the cell phone itself. Part 2 in the two-part series on the latest in video editing technology can be found here.